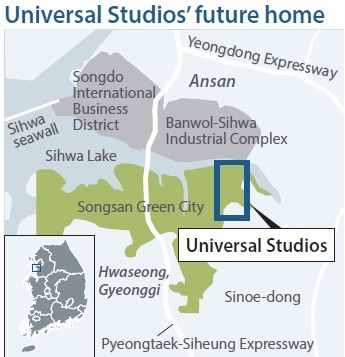 The world’s fifth Universal Studios will open in Hwaseong, Gyeonggi, as early as 2020. The decision came a decade after a plan to bring the famous theme park to Korea was first floated. The theme park is expected to be popular with domestic Korean customers but also with tourists from neighboring China. A Chinese consortium is participating in the construction. 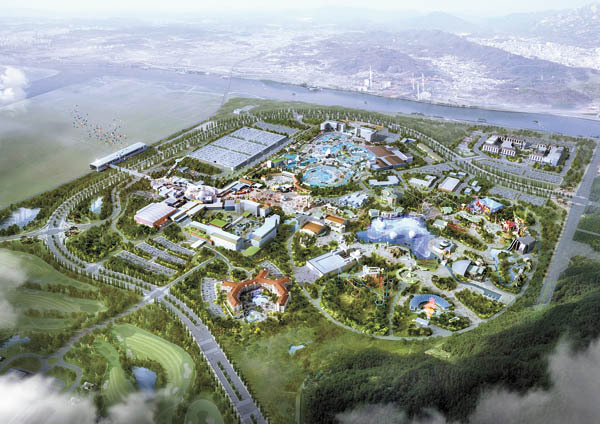 K-Water, the state-run water resource management company, announced on Tuesday that Universal Studios will be built in Songsan Green City, an industrial complex being developed on land it owns. Songsan Green City is just south of the Songdo International Business District and Incheon International Airport on the west coast of the Korean Peninsula. It is a half-hour drive from the airport and 50 minutes from the posh Gangnam District of southern Seoul. The complex will host the Universal Studios theme park and hotels, condominiums, a golf course and residential apartments. Hwaseong Universal Studios will be the world’s second-largest theme park, covering an area of roughly 4.2 square kilometers (1.6 miles). K-Water said it picked a Universal Studios Korea consortium led by China’s largest state-run builder, China State Construction Engineering Corporation, and its largest state-run tourist agency, China Travel Services, as a preferred bidder for the project. The consortium also includes the Korean construction firm Daewoo E&C and Korean engineering consulting firm Dohwa Engineering as well as Universal Studios Korea Property Holdings. During the press conference, Choi also asked for approval for a foreigners-only casino, which is not part of the theme park. “A casino will help the project take root with more stability,” Choi said. The entire project is estimated to cost 5 trillion won ($4.25 billion): 3 trillion won to construct the park, hotels and residential apartments, and 2 trillion won to manage the park. The consortium will be investing 850 billion won, or 30 percent of the 3 trillion won required for the first phase. The remaining 70 percent will be borrowed as a project finance loan from KEB Hana Bank, as well as funding from the central government. The 2 trillion won needed for management will be made from profits generated by preliminary sales of residential apartments. Korea’s Universal Studios aims to bring 1.4 million foreign tourists into the country every year, mostly Chinese. One way to attract Chinese tourists is to develop entertainment related to Hallyu, or the Korean Wave of cultural products like K-pop. In 2009, Lotte Asset Development first attempted to form an international consortium to build a Korean Universal Studios. But it failed to attract foreign investment due to the 2008 global financial meltdown. The opening date of the theme park has been set for 2020.